Inside CRM 2011 Process editor it's not possible to get the current user, in some cases a reference can be necessary (specially for automated workflows) in order to set the right user when the workflow is used to create or assign records. A Custom Workflow Activity can be created for this purpose, taking advantage of the InitiatingUserId property. A common customization requested by customers is to execute some logic when a Sub-Grid is refreshed. Unfortunately the Xrm Object Model doesn't provide a method to bind a function to the refresh event. The following code is compatible with UR12/Polaris update that introduced cross-browser support for CRM 2011. The first parameter is a string and quotation marks are necessary, the second parameter is the name of the function and must be written without quotation marks. When a new Phone Call is created starting from an Account, the default recipient is the Account itself. If we want to set the Primary Contact of the Account as Recipient, we need to call the following function inside the OnLoad event of the Phone Call entity. These days I got the chance to read Microsoft Dynamics CRM 2011 Cookbook, a book written by Dipankar Bhattacharya. 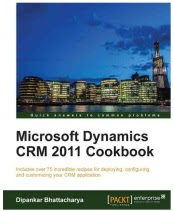 The book has 10 chapters and is structured as a list of recipes, covering different arguments about Dynamics CRM. This is the largest chapter, it not only covers the installation of Dynamics CRM Server but also other components such as Reporting Extensions, E-mail Router, Outlook Client. Step by step instructions and appropriate screenshots. A basic knowledge of SQL Server is required for this chapter, especially for the Backup & Recovering part, useful the sections explaining how to enable tracing. The first three recipes assist the users to configure SSL, Claims-based authentication (AD FS) and Internet-facing Deployment (IFD), the other recipes describe how to manage business unit, users and security roles. This chapter goes through importing and exporting data, a nice addition the section about Auditing. Explain (and implementing) Dynamics CRM Solutions isn't an easy job, probably a book can be written regarding this argument. The author gives a good overview, introducing also the translation process. These 2 chapters explain how to customize CRM, the concepts inside are deeply connected (you can customize CRM without installing it, but you can't customize forms and views without a good knowledge about fields and relationships). The content can look obvious to a Dynamics CRM developer, but it contains tips about Rollup Update 12 and the new Process Driven Forms. The chapter describes how to edit the Site Map and Ribbon Definition XML, actually there are several tools that can be used to perform these modifications, but these pages can be considered a good reference. Well, I don't face SharePoint integrations every day, so probably next time I will use this recipe to guide me. The chapter covers also the Mail Merge functionality, both arguments are very interesting. The final chapter is the real surprise of this book. Workflows and Dialogs are very powerful and inside these pages are well explained. This part is a must-read also for end users who create or maintain processes in their CRM. Note: the chapter doesn't cover the creation of Custom Workflow Activities. A technical book is not a romance, this means skipping chapters or read over and over again the same pages. The variety of the arguments makes the book interestng for those who want to expand their knowledge about Dynamics CRM (a developer curious about the installation process) but also for those who face Dynamics CRM in the early stages of a project.